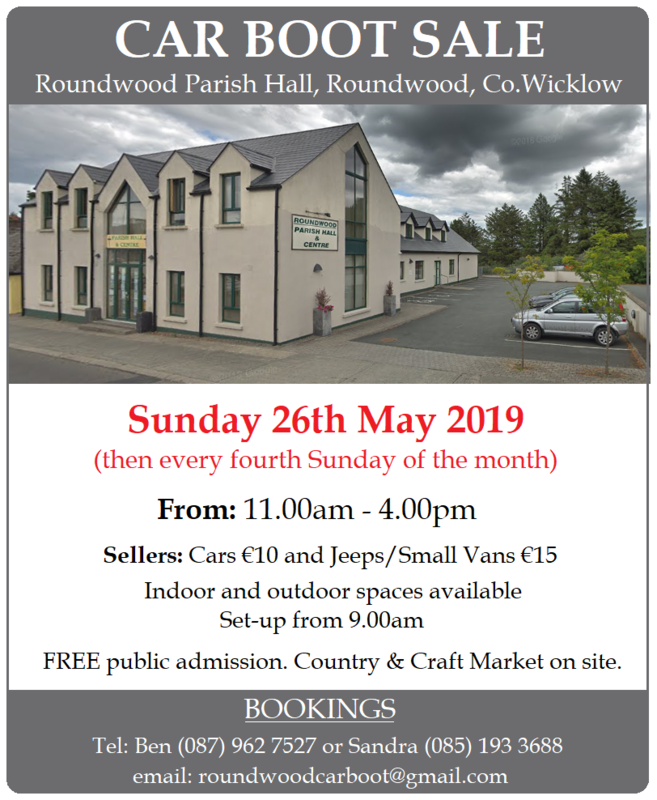 Starts this Sunday – 28th April – see Co.Limerick listings for full details. Sellers: only €5 per pitch! Free tea and coffee as part of the registration. 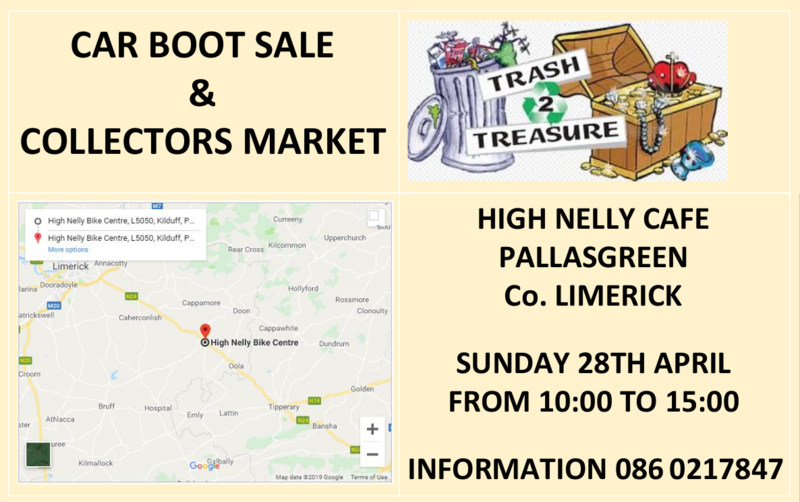 Belturbet Car Boot Sale has been running since 2003, and combines not just Car Boot regulars, but includes newcomers, local Farmers Market and artisan food producers, local crafts, and Belturbet Tidy Towns Recycle Shop. Belturbet Tidy Towns volunteers run the Shop as a means of recycling those unwanted items that others may value, and as a modest fundraiser for our activities. We invite those who haven’t sampled this yet, to drop in. There is serious value to be had! If anyone would like to set up a stall and sell their quality unused items, this is exactly what the Car Boot Sale is all about, please contact either of the people listed below. 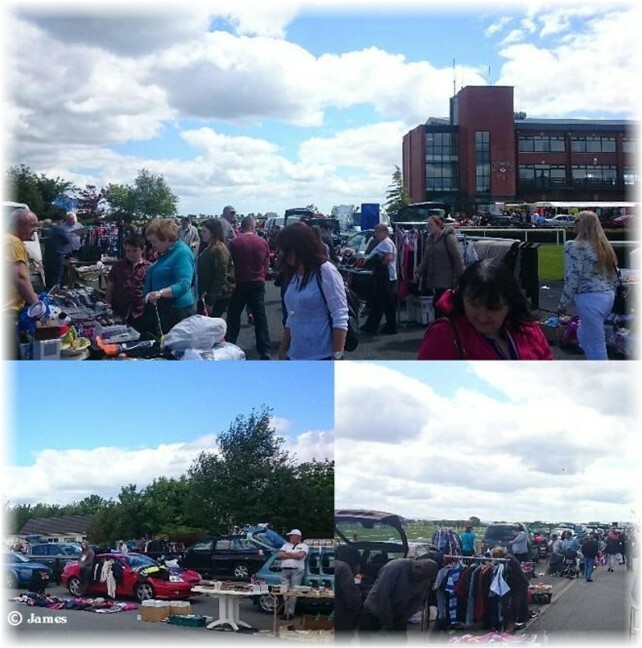 A mixture of sellers with everything from bread, meat, fish, bric-a-brac…. Busy, busy, busy according to James – thanks for the photographs! 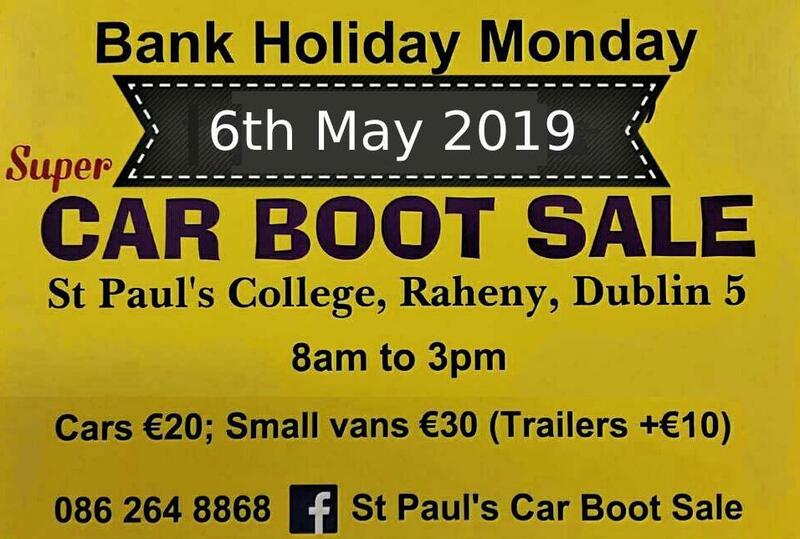 Sellers: €10 cars and €20 vans – no need to book in advance. At the Grotto in Blackpool go right, up Dublin Hill and keep going until you reach the Y junction at “The Black Man” pub. Take the left fork and at the bottom of the hill go left at the sign for the Cemetery (sign on right side of the road). Follow this road and park in the parking area next to the graveyard. The Campsite is across the road. Traders, please queue at the marked gate to enter the site. Customers €2 per Adult, Children free! Sellers: €10 per Car or Van. Sellers set up from 8.30 am. Stallholders must bring their own tables – please! Free Refreshments available to sellers. Coming from Cork, head for Kinsale, go through Riverstick and continue to Belgooly and turn right at the pubs for GAA pitch. Should be signposted. 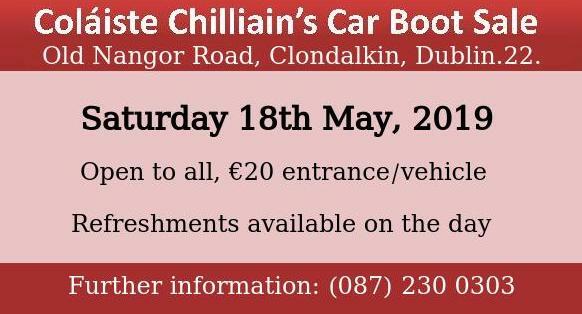 The cost of entry is now €15 for a car, €20 for a van and €3 entry for customers. The club grounds open at 7.30am for sellers. NO BOOKING REQUIRED – just show up on the day! Refreshment and toilet facilities available. Open to the public from 7.00am and usually finishes up about 2.30pm. No bookings accepted – first come first served. 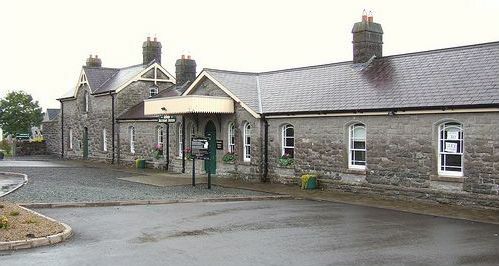 Sales signposted from the square in Castletownroche. 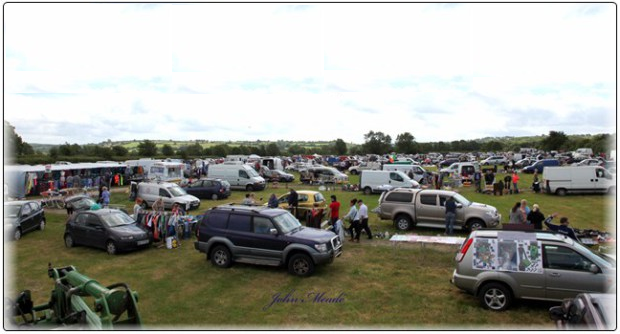 Great, friendly atmosphere with plenty of parking spaces and trading pitches – inside and out. No need to book in advance just come on the day bring a helper along if you like at no extra charge. Inside area makes it ideal for all weather conditions with plenty to be seen inside and refreshments being served all day. 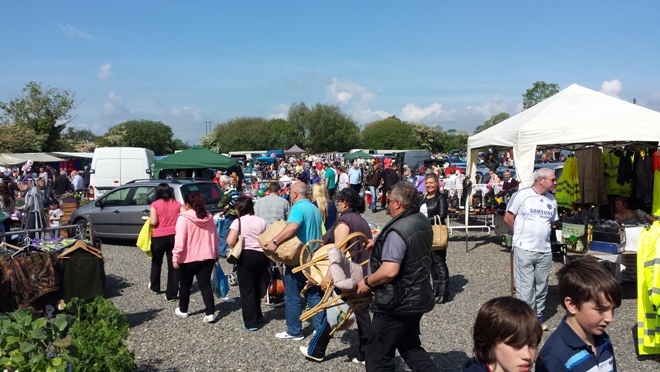 Be it for a day’s shopping or a friendly chat, Castletownroche Car Boot Sale is a great way to pass your day. 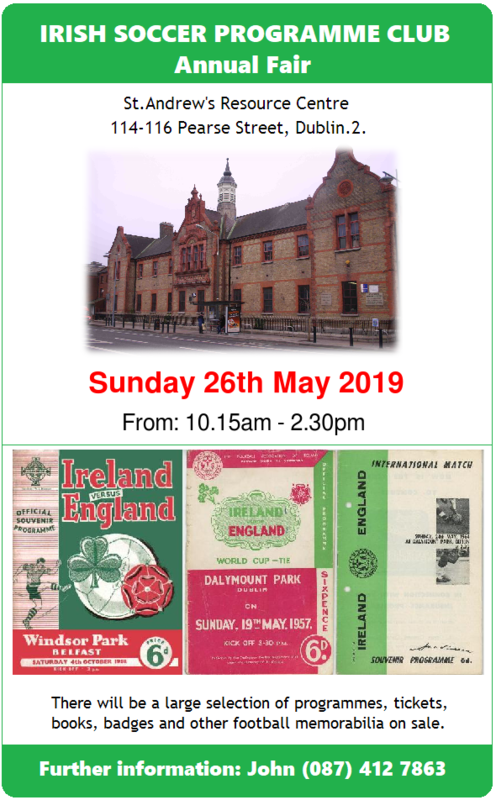 Admission: Adults €2 and children free. Facilities: Refreshments and toilets on site. *Indoor area in event of poor weather. From Limerick turn off the N20 to the left heading for Doneraile approx 5 miles at the Cork side of Charleville. Continue through Doneraile taking a left at the top of the village follow signs for Castletownroche. From Kerry, Mallow or Fermoy follow the N72 to Castletownroche. Sellers: Car €8. Car + trailer €10. Van €15. Van + trailer €20. 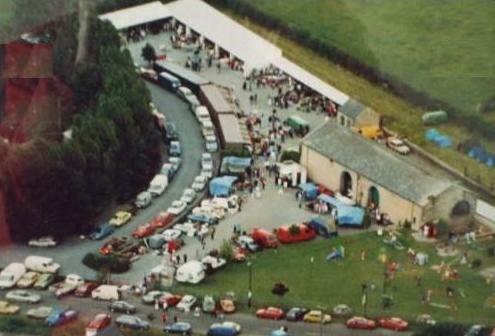 The car boot sale takes place in a field on the Castlelyons road. 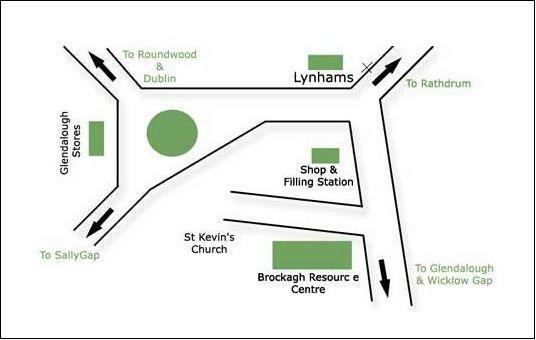 Coming from Cork, turn right at the Rathcormac Inn and the field is located on the right. It’s well signposted. It is advisable to arrive early, especially if the forecast is good. Arriving early means you can choose to set up in a good location. You need to bring your own display stall. Some people use tables and others just use a sheet to lay on the grass. The queue of traders can normally start anywhere from 7:00am but any time up to 8:30am should be fine. So, you just need to turn up on Sunday and someone at the gate will point you in the correct direction. Refreshments and toilet facilities available. Gates open at 7.30 am until 4.30pm. Apparently, traders start to gather as early as 6:00am!! Directions: If you are coming from Dublin on the M1, there are two exits for Balbriggan. The 1st exit is signposted as Balbriggan/Walshestown. 2nd Exit is signposted Balbriggan/Naul. Take the 2nd exit. When you reach the top of the slip road, turn right and head over the motorway bridge, go through the next small roundabout on the other side of the bridge. Take the next right and it’s only a few yards further on from the roundabout. The entrance to the market is about 200 yards down on the right-hand side. 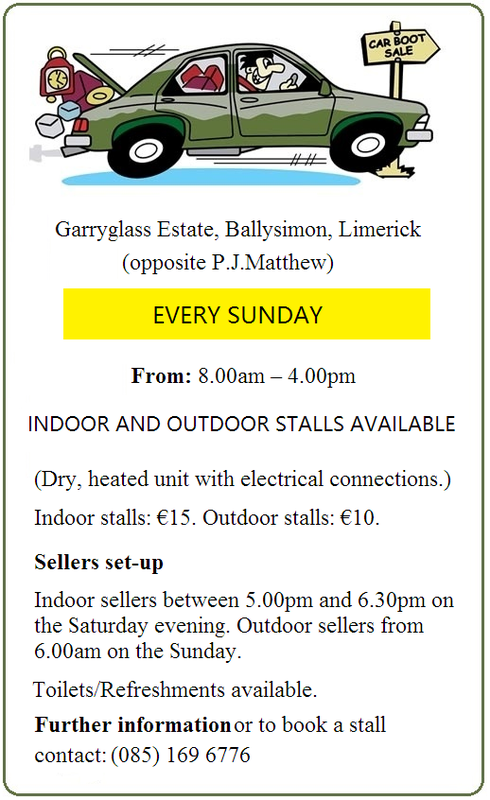 Buyers: €2 fee to park the car, but it is a large market with, I would say, easily over 100 stalls. It’s just held in a very large field, so people should bring their wellies if it has been raining. Well worth a visit! Trinity Comprehensive Secondary School, Ballymun, Dublin.9. 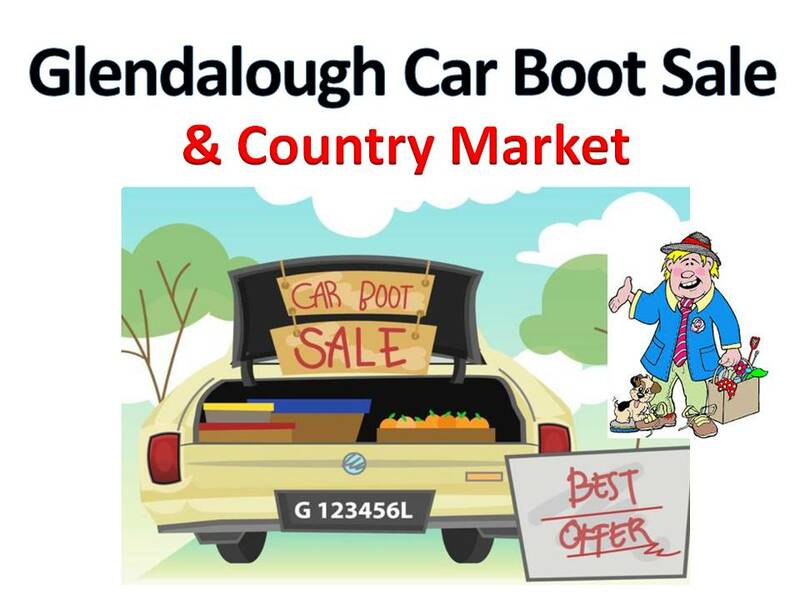 Please note that the car boot sale section only caters for people wishing to sell items from their homes and only small vans (Berlingo/Caddy People Carriers/SUVs) are allowed. Hiace/Transit/Sprinter type vehicles are not allowed. Clontarf & Scots Presbyterian Church Grounds, Dublin.3. Sellers fees: €20 per car – NO large vans! Vans and electrical goods are not allowed. Old Finglas Road, Glasnevin, Dublin.11. 12th May and 26th May. Howth Road, Raheny Village, Dublin.5. Old Nangor Road, Clondalkin, Dublin.22. Sellers fees: €5-20 depending on the vehicle. Sellers: €15 for cars. €20 small vans. €25 large vans and commercials. NO PRE-BOOKING required, just turn up and pay at the gate. Traders: From €15 (includes PL insurance) – tables are supplied. 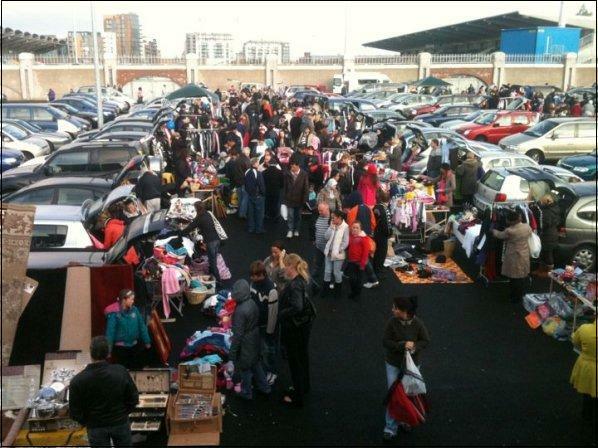 Many outdoor & indoor trader stalls/tables available. €20/25 charge for table space. A large Indoor facility which includes Cafe and toilets with disabled person access. So if the weather is wet there’s still plenty to see inside where it is dry! Sellers: Cars €15. Public admission free. Contrary to listings elsewhere this is a market with some casual traders selling books, bric-a-brac etc rather than a car boot sale venue. Operates on the last Sunday of each month except December when it is held on the second Sunday of the month. 26th May; 30th June; 28th July……….. 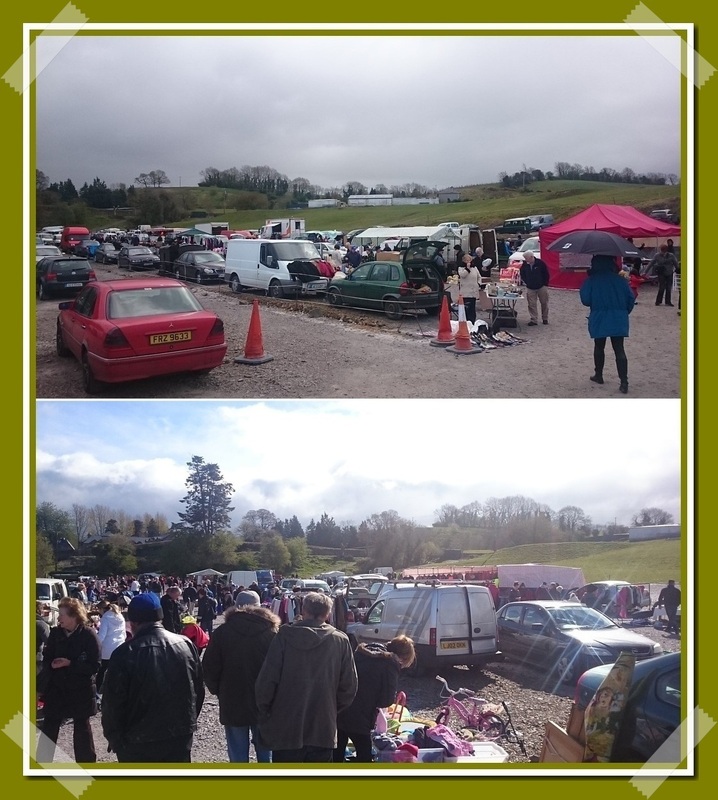 There are approximately 30 Car Boot stands + over 250 Stalls in the market. There are plenty of facilities including toilets, refreshments, places to sit down, parking, invalid parking and toilets. 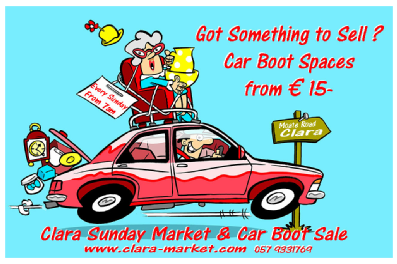 Car Boot spaces must be pre-booked on the Thursday before you wish to sell by telephoning (087) 637 2558 after 10am. Sellers: Cars €25 and Vans €30. Traders can arrive from 7.00am onwards. No pre-booking is required simply turn up on the day. Traders selling both new and previously owned items… Tools, Clothes, Flowers and Plants, Toys, DVD’s & CD’s, Household Items & Gifts, Car & Machinery Accessories, Dog Food, Fishing Tackle, Riding Tack, Motorbike Gear, Work Wear, Shoes & Boots, Floor Covering, Fireplaces, Cakes & Home Cooking and more! Established in 1993 it is one of the bigger markets in Ireland attracting customers and stall holders from all over the country. Admission: €1.50 which includes entrance to Folk Museum. 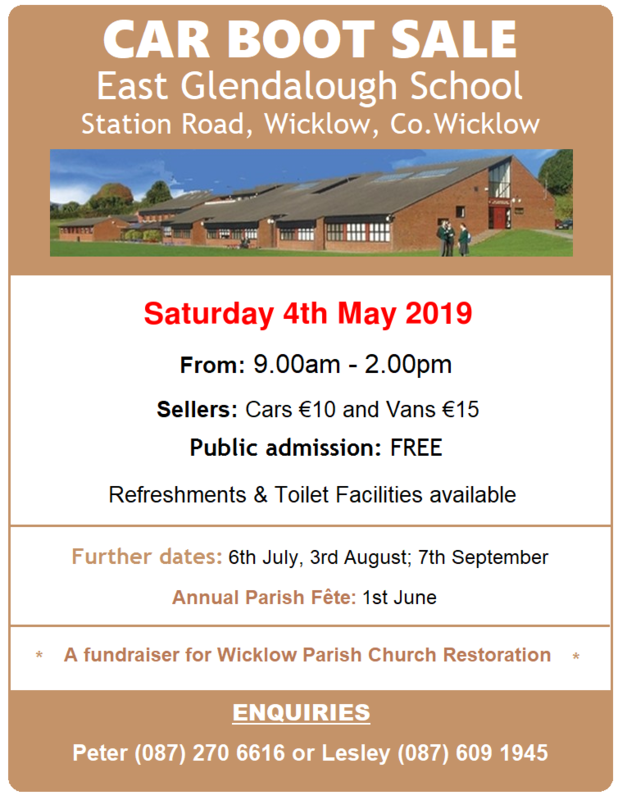 Prices for Stalls – limited amount of tables available to use €12, or book a space and bring your own table €10. PLEASE PRE-BOOK YOUR SPACE TO AVOID DISAPPOINTMENT! 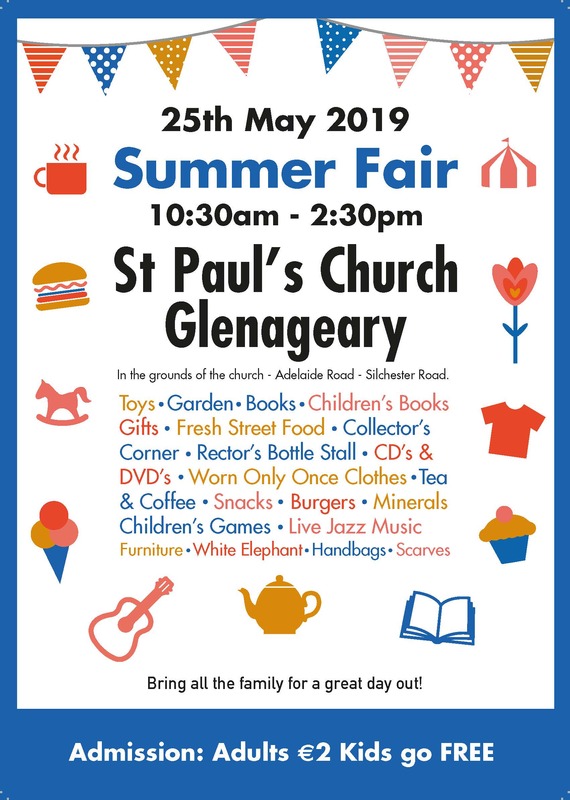 Fancy having a browse, bagging a bargain, or maybe selling some unwanted items? Tramore’s Big Booty is the place for you! The last Booty was full of sellers with some lovely items for all you bargain hunters! With free admission, free parking, food & beverages on site and ALL INDOORS- this is the best place to head on a Sunday whatever the weather! Refreshments and tuck shop available. Tea Coffee and soup are available for €1 each, as well as cheese and sausage toasties for €2. Why not pop in before/after a stroll on the beach? At St.Mogue’s Community Centre. At the crossroads by Inch Parish Church and Londis. Just off the old N11 road before Inch village. Signposted. From: 9.00am – 3.00pm for buyers. Location: About 3 miles south-west of Wellington Bridge on the R733 – about ten minutes from Passage East car ferry. Cars €10. Vans €20. Trucks €30. Adults €2 and children FREE. Every Bank Holiday Monday – and occasional Saturdays. 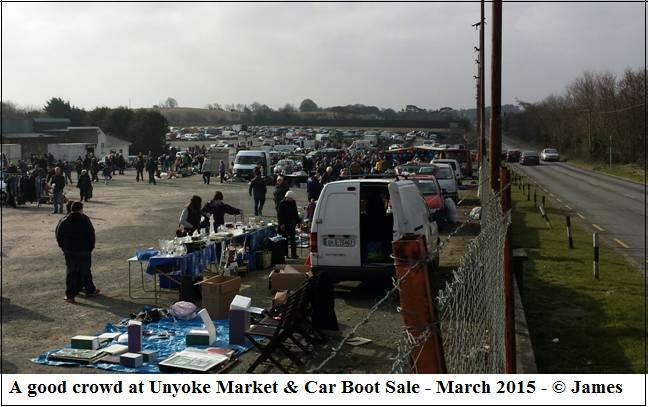 The Unyoke Market & Car Boot is worth a visit providing it’s dry! It gets very messy and dirty if there’s any rain and as most of the stuff is on the ground as opposed to tables, this is a big disadvantage. Like any market the earlier the better. One of the traders told me that she’s there at 6.30am and dealers would be going through her stuff with a torch. I can be there at any time after 9.00am and it seems to be at its busiest from 9.00am to 11.30am. If you arrive after 11.30am some traders are already packing up. Sellers: €12 per car in the hall if it’s raining and €10 for outside in carpark. Also Tea and Coffee for stall holders @ 50c. Hi is blessington on this sunday do you know ? I just spoke to the organisers and it is on this Sunday. Sorry for not having it listed. 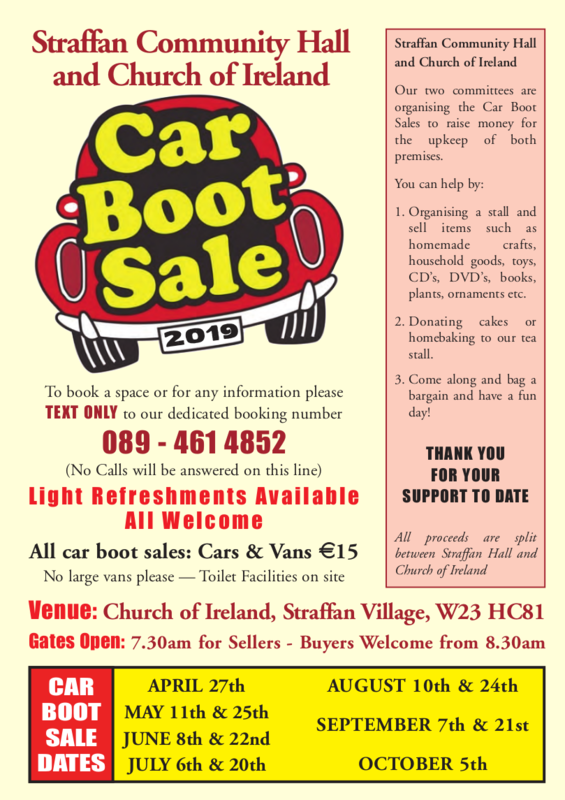 In case no one has let you know there will be no car boot sale this Sunday 2nd October at Ballywaitrim Bray due to an Irish Dancing Competition. Thanks for the reminder. I was told but somehow forgot to post. What part of the country are you in and are you talking about markets or car boot sales? Anything coming up in Kerry besides the one in Tralee? Only what’s listed I’m afraid. Nothing much stirring down there at the moment – I list as soon as I hear of anything. 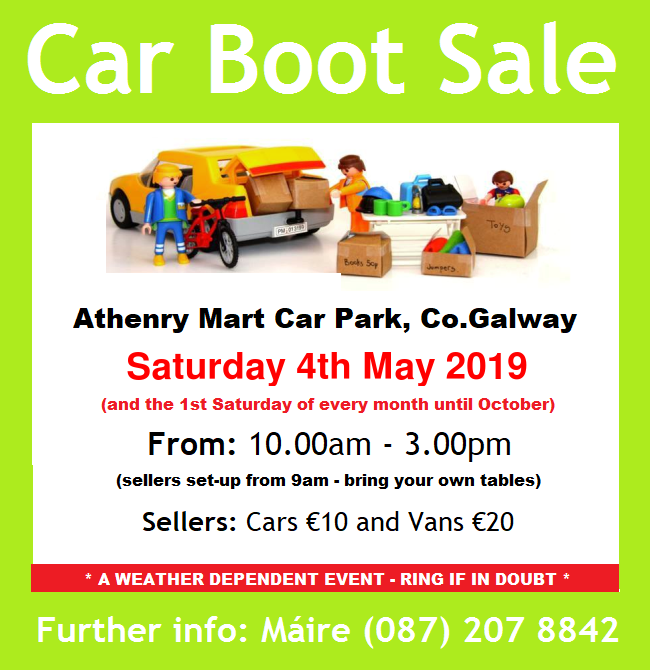 Athenry Car boot sale is back!! Yay, I’ll be contacting ye with the full information. Meanwhile, thank you David for keeping your terrific blog going! I understand that the sales at St.David’s are due to restart on Sunday 23rd April but I’m awaiting confirmation. I’ll post the details as soon as I have word. Hi David just to say I was in Athy carbooth sale on Saturday March 26th and the fee is 16 euro ans not 13 euro. The ground is very rough and the exit path was very muddy. Thanks for the wonderful work you do. Thanks for the wake-up call and I’ve just updated the listing. Sorry – can’t help you here. Their website doesn’t mention whether the sale is on and they refuse to answer emails – for years at this stage. 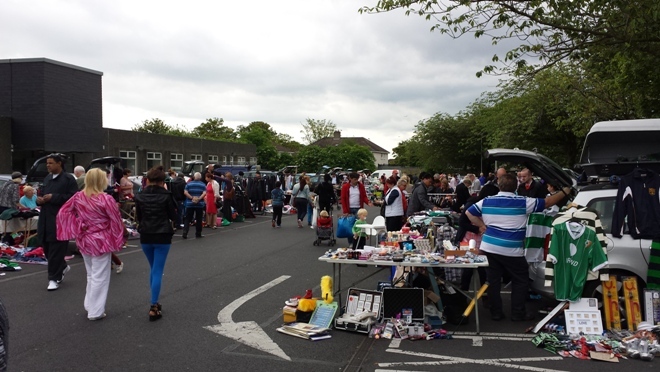 Is the car boot sale in Dun Laoighaire in the school not running anymore? The Tivoli Road sale in Dun Laoghaire is long gone. 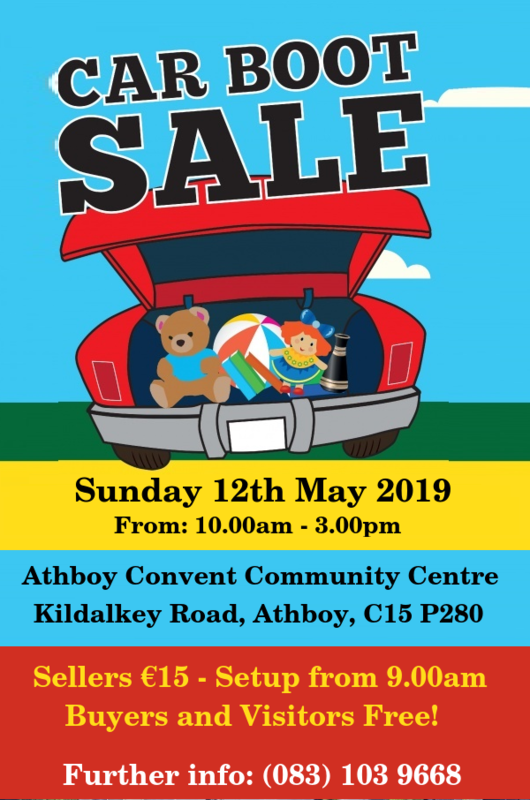 I’m in the Wexford area with many a car load to sell, just wondering if anyone can tell me the best/busiest car boot sale to go to in or around the area. BTW thanks David for all the updated info on the site. Have you tried the Unyoke? 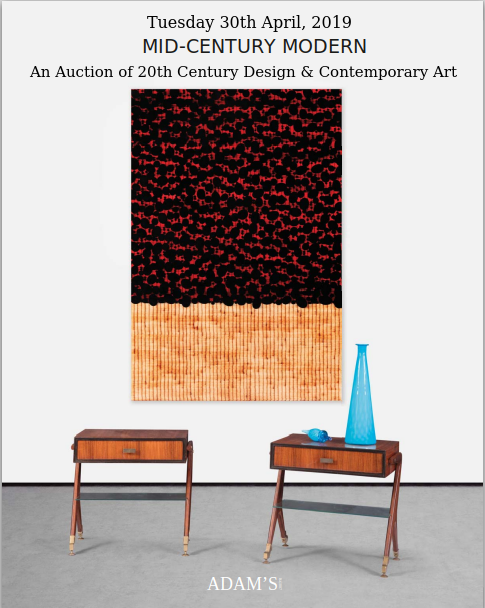 I haven’t been for a while but have found it to be good – as a buyer – in the past. 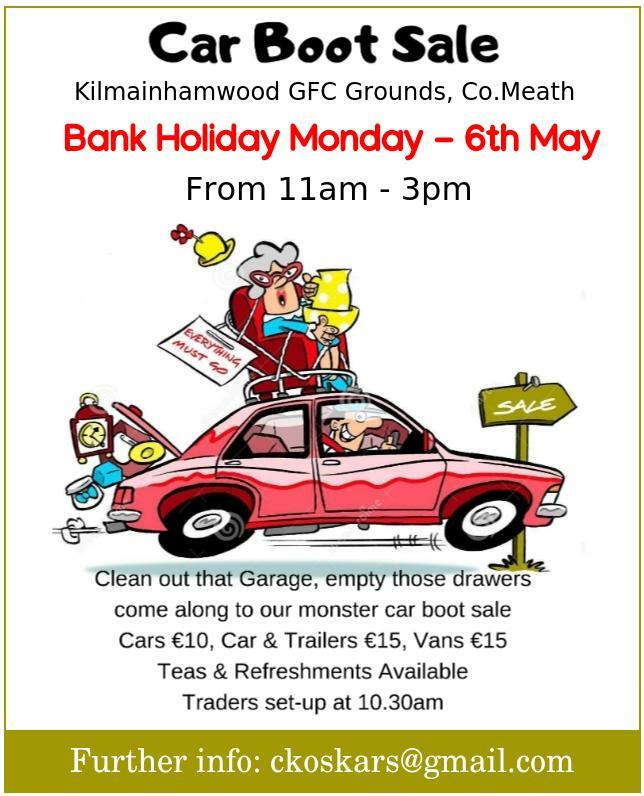 Could anyone advise on Cork / Kerry Car Boot Sales? I’m looking at Castletownroache and Kilcully, both on this Sunday 10 Sept. which is busier? This is all new to me! 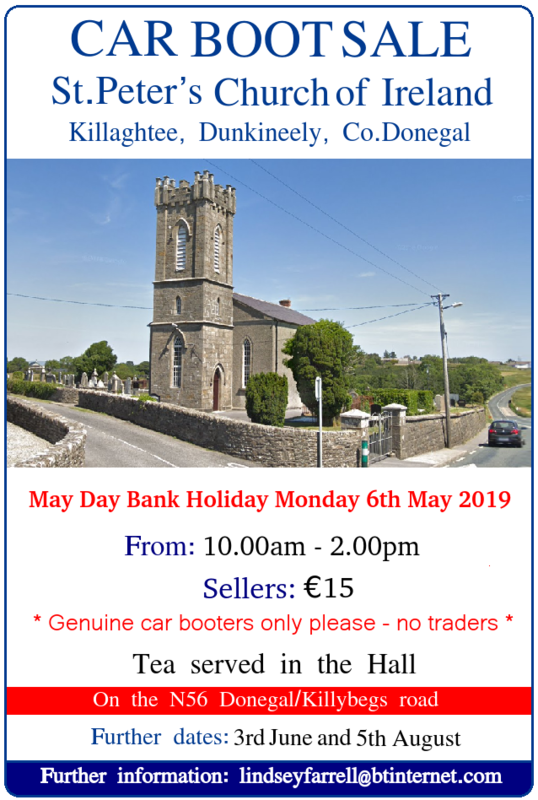 hi anyone know if the Tuamgraney, Scarriff Indoor Car Boot Sale is any good for selling bric a brac and a few new items, heard the entrance fee limits people going? Hi, had a look on here afew days ago and I was sure I saw a listing for Milltown Co Galway on the 11th of November. Just looking there to confirm the details and I can’t find it…an I going mad? Was there a listing removed? 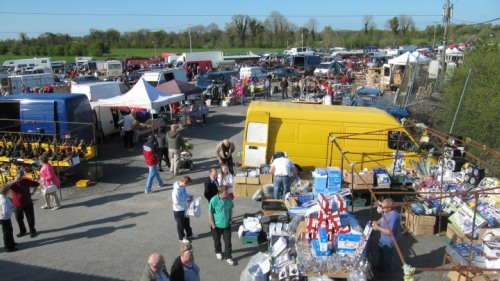 Anyone know of any carboot sales near Galway at all? Seems to be a serious lack of them. Don’t recall this sale! I haven’t removed anything from the Galway listings recently. 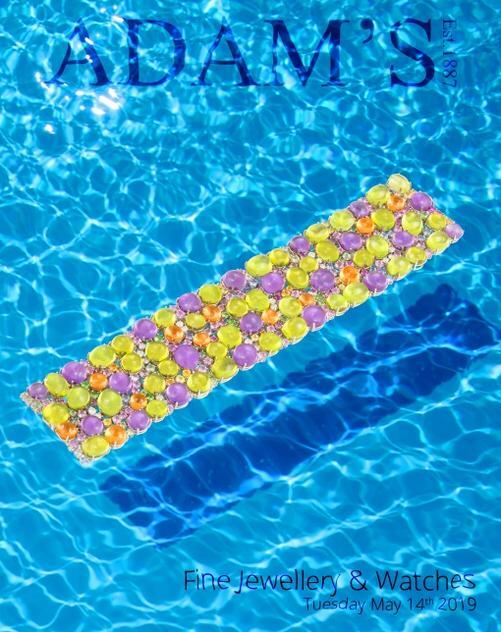 Sorry – perhaps on another site? 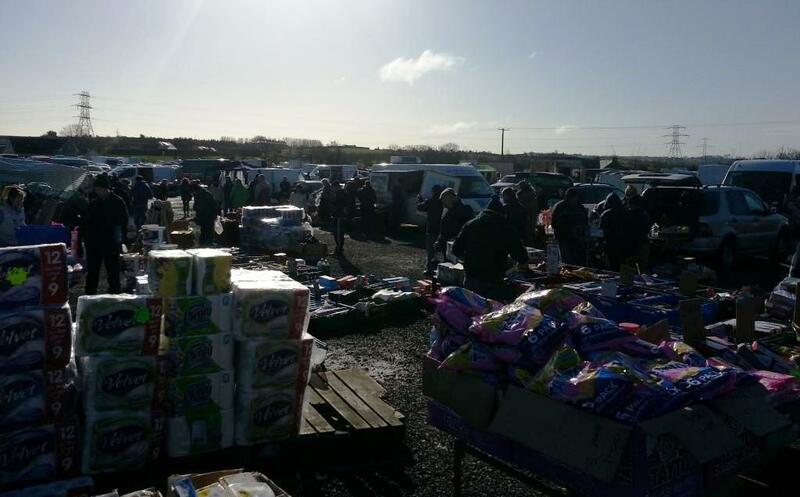 Bray’s Boghall Road Car Boot Sale is NOT on tomorrow, Sunday 25 February 2018. Good suggestion. I’ve just deleted comments up to Spring 2017. Sadly, “Collect Ireland” isn’t really suitable as a message board and I haven’t the time or energy to devote to moderating a proper car boot forum. Thanks for giving me a push. 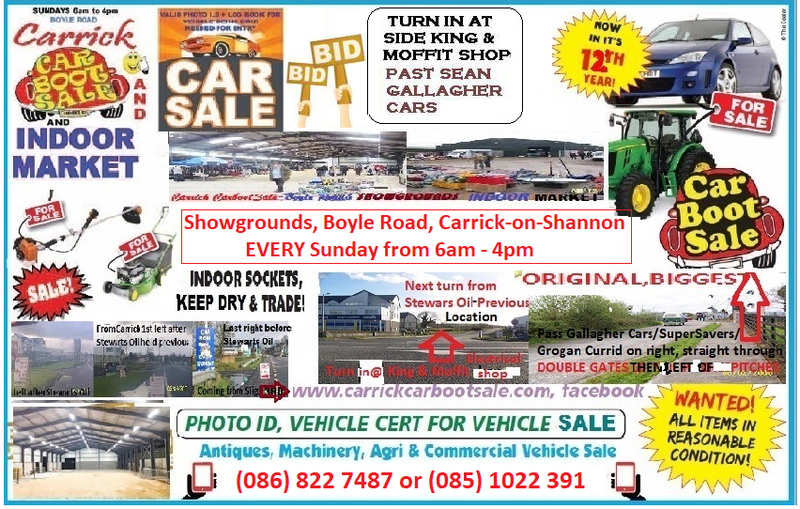 Did not see start and finish times for car boot sale Skibbereen 29/04/2018; please advise? 11am – 4pm as stated on their flyer. 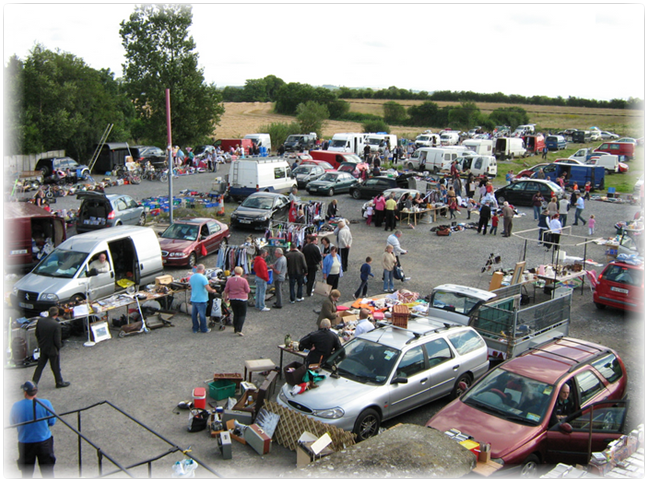 There is a very large Carboot sale at Longford town stadium car park on Bank holiday Mondays during the summer. Hi there.We are hoping to visit Cork on Sun 8th July.Which car boots are the best/ biggest to go to? Thank you. 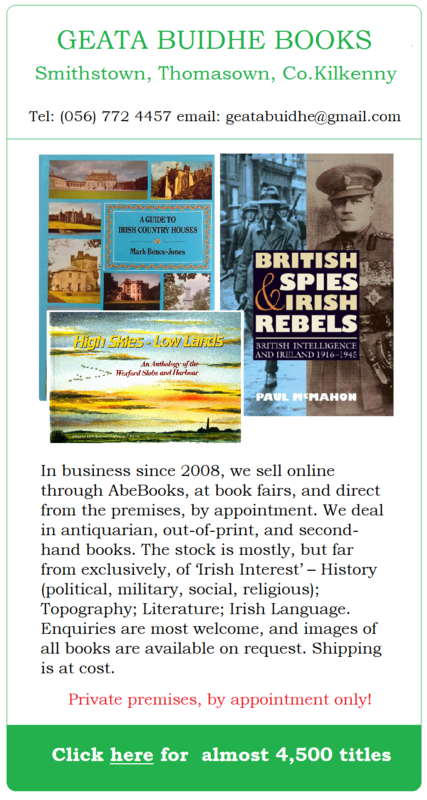 Hi Annemarie – I’m afraid that I can’t help you as I have zero contact with anybody connected to the market at Balbriggan. I’m approving your comment but I doubt that you will hear anything back as this site isn’t really a discussion forum.